Web and phone voting pilots should be stopped until security and testing have been improved, the Electoral Commission has said. It said much has been learnt from recent pilots, but added that "there is little merit" in holding more. Thirteen pilots were held during May's local elections in England. Election minister Michael Wills said pilots were important for developing services that were "efficient, effective, empowering and responsive". The commission examined electronic voting, voting in advance of polling day, electronic counting and signing for ballot papers at the polling station. The security of the voting process "needed to be strengthened" through a system of individual registration, it said. Concerns were raised about low public confidence in the security of internet and phone voting, accessibility, and technical difficulties. The commission called on the government to publish a strategy for modernising the electoral process - including changes to improve security. It recommended that there should be improvements to testing and implementation of electronic voting and electronic counting. 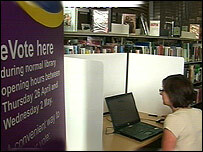 Further pilots for voting in advance of polling day were not necessary. Commission chief executive Peter Wardle said: "We have learnt a good deal from pilots over the past few years. "But we do not see any merit in continuing with small-scale, piecemeal piloting where similar innovations are explored each year without sufficient planning and implementation time, and in the absence of any clear direction, or likelihood of new insights." He welcomed recent government proposals on constitutional reform, with the hope that they would include modernising elections. Among May's pilots, there were technical difficulties with electronic counting in Breckland, Stratford-on Avon and Warwick which prompted it to be abandoned in favour of traditional manual counting. The commission said the problems were mainly a result of limited testing and insufficient planning prior to the election - and recommended a minimum of six months for implementation. Mr Wills said the Ministry of Justice would study the Electoral Commission's report. "These evaluations point to instances where e-counting and e-voting have worked well, and where electors choose to vote remotely by internet or telephone they often had favourable responses to these innovations," he said. "The purpose of pilots is to learn lessons for the future and we will do so." Despite the commission saying security needed to be "strengthened", Mr Will said: "We are pleased that the evaluations point to a high level of system security and user confidence in e-voting systems tested and that the security and integrity of the polls was not compromised. "We have also made considerable improvements to security of elections more widely." A group that campaigns against the introduction of electronic voting said it welcomed the commission's call to stop further pilots but was disappointed it did not go further. The Open Rights Group (ORG) said: "The government does not seem to be learning the lessons of previous pilots. "We believe this technology is not appropriate for public elections, and now is the time for a public debate."